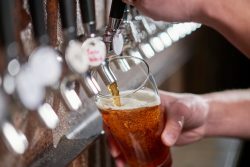 SETsquared Bath’s pioneering sustainable technologies programme has attracted a company that is dedicated to serving the perfect pint as it ramps up its role as the UK’s first business acceleration hub dedicated to the sector. Oliver Browne-Wilkinson, founder and owner of StapleBarn Ltd, is the brains behind AleTrim, a unique nozzle that easily fits onto the end of any beer tap and controls frothing, to deliver the perfect pint without the spillage. Oliver came up with the idea for AleTrim while waiting to be served at a bar, when he noticed how much beer was ending up in drip trays. The Bristol-based inventor is on a mission to help the global beer industry become more sustainable, with his simple device that reduces waste when pulling pints. Aletrim uses the science of Laminar Flow to minimises dispense waste. The environmental benefit is significant and has potentially huge positive impact for brewers, retailers and for consumers. AleTrim is now available to buy in the UK or for export markets. The discreet device uses the science of laminar flow to ensure the ale or lager enters the glass in a smooth and stable state, increasing cask and keg yields. As well as reducing waste from each keg to less than one per cent, AleTrim can dispense the perfect pint in less than five seconds. An interactive tool on the AleTrim website can help landlords and business owners calculate how much money they could save by installing the device on their taps. The University of Bath Sustainable Technologies Business Acceleration Hub (STBAH) has been launched to help grow a new generation of innovative small firms in the sustainable technologies sector. Pete Keevill, Entrepreneur in Residence will work with the Founders to create a bespoke programme to support AleTrim with further research and development using expertise from the University of Bath. The STBAH programme is open to firms across the West of England in South Gloucestershire, North Somerset, Bristol and Bath who are dedicated to harnessing technology to tackle some of the key issues in the low carbon and sustainable sectors, from transport and power to the way homes are built. The support is free and funded through the European Regional Development Fund, it is operated by the University of Bath Research & Innovation Service and supported by Low Carbon South West (LCSW). To find out more and apply go to STBAH.co.uk.